Tony McGee not only hit well in this August 1989 win for short-season Spokane, but the catcher also did well behind the plate, according to The Spokane Spokesman-Review. The opposing manger told The Spokesman-Review he didn't think he saw McGee's pitcher shake off McGee once. McGee's own manager could only praise his catcher. "He did a real good job calling the game," Spokane manager Bruce Bochy told The Spokesman-Review. "He kept the hitters off-guard." Despite the praise McGee received that game, his overall career ended up being a short one. That was his first season as a pro. He ended up getting into just one more. McGee's career began that year, taken by the Padres in the 19th round of the draft out of Jacksonville University in Florida. 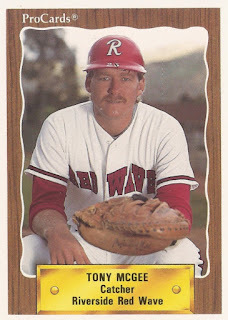 McGee started with the Padres at Spokane. He hit .206 in 43 games, picking up 17 RBI. He had a two-run double in June, picked up two hits in a July game and knocked in two in another. He scored twice in that August game. McGee moved to high-A Riverside fo8r 1990. Over 80 games, he hit .209 and batted in 30. It was his final season as a pro.